February 7, 2018 / J.K. Rating – If you are looking for something. 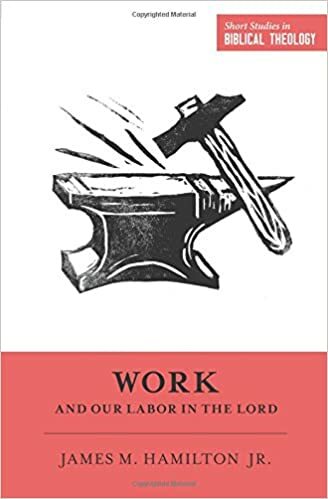 Hamilton attempts to concisely write a theology of work – why we work, what it means to work, and what it would look like to ‘labor for the Lord’. The book is broken into four main parts: work before the fall, work after the fall, work now after Christ’s coming, and finally, work in the new heavens and new earth. I’ll start off by saying I think this is one of the most difficult topics for which Christians can write. Not necessarily because the Bible is unclear on work, it is, and not because I thought Hamilton didn’t handle the theological points well. In fact, I thought he did a masterful job from a Biblical perspective; though there were occasionally odd section that appeared to have political undertones, but I guess that’s to be expected from an evangelical publication (or maybe I just read too much into it, and watch too much politics). No, the problem is the reader. Especially me – educated, white-collar, upper-middle class reader, who has actual opportunities to think about different careers or finding fulfilling jobs. Due to the reader problem, I think books on work are hammered twice. First, because the reader looking for answers, such as what should I do with my life, do not find any and may come away disappointed. Second, because those are the readers, the authors tend to focus on that demographic. Hamilton avoids some of these trappings, probably due to his focus on theology, but they do show up. I won’t digress any further on that point. The strength of this book is the first section, work before the fall. In our Biblically illiterate, 140 character limit culture, we miss too much of what the Bible actually says. For most of my life, I believed work was punishment for sin. I was around 30 before I heard someone point out that we worked the garden, it was one of the first commands from God and our original role in this world. So, work isn’t our punishment for sin, but our sin has corrupted out work. Hamilton does a great job of teaching and explaining this Biblical truth. This point is expanded on in the work after the fall section as well. I especially liked the references to Ecclesiastes; which is always a great reminder of the way we view life in general, but I’m not sure I’ve seen it related specifically to work. Overall, it is a solid book, but it left me wanting a little more. I’m probably a little too critical of Christian books focused on work, so if that is a topic you are studying you should put this book on your list. If not, you might want to skip. It is short, so that is a positive (why not just knock it out) and a negative (maybe not as in depth as you’d like). The Biblical Theology is strong, so that would be another reason to read it. So, grab this book, if you are looking for something.